The ancient ruins of Teotihuacan (teh-oh-tee-wa-can) have fascinated visitors for centuries. This amazing archaeological treasure is located on the central highland plateau of Mexico, surrounded by mountains and much mystery. Teotihuacan is an incredible place to visit and many believe it is the most important archaeological destination in the country. Indeed, these ancient ruins are magnificent to behold, fantastic in design and awesome in their beauty. Located just 30 miles northeast from present-day Mexico City (add link), Teotihuacan was the New World's first great metropolis. Enormous in size, at its zenith, Teotihuacan housed up to 200,000 residents and encompassed 12 square miles. The civilization which flourished at Teotihuacan was contemporary to that of ancient Rome. However, unlike that fallen city, Teo's civilization lasted centuries beyond Rome's demise. Remarkably, Teotihuacan seems to have sprung up out of nowhere, having no precedent in the ancient world. Archaeological evidence does indicate that the geographic area of Teotihuacan was inhabited by humans as early as 500 B.C. However, actual construction activities of the great city didn't commence until 1 B.C. with the initial building phase of the site's famous Pyramid of the Sun. A total of three pyramids reside at Teotihuacan as do temples, palaces and residential compounds. The time period in which Teotihuacan flourished was approximately 2-6 A.D with its apex occurring circa 5 A.D. By 700 A.D., the city was abandoned, for unknown reasons. Many suggest that the city could no longer meet the food needs of its vast population, perhaps due to drought or over-use of arable land. However, even if this is a plausible cause, it doesn't nearly explain why the city was set on fire and its most important temples desecrated. While in existence, however, the influence that this great city exerted in ancient Mexico was profound with its imprint reaching as far away as the Yucatan and Guatamala. The citizens of Teotihuacan were superb craftsman whose products were traded throughout ancient Mesoamerica. As well, people from all over Mexico would come to the city for rituals and ceremonies. It is noteworthy that the city had no fortress or other means of defense. During the time of its glory, Teotihuacan would have needed no such accommodation, as its power and influence were supreme throughout ancient Mexico. Part of the great mystery surrounding Teotihuacan is the origin of the city's original inhabitants. We do not know their ethnicity or from whence they came. Great conjecture has been made concerning this point with the mystery still unsolved. There are no written records or codes to decipher, which would undoubtedly shed light on this matter. Even the original name the city was given by its original builders is not known. The nomenclature of the site, including the name Teotihuacan, was bestowed upon the city primarily by the Aztecs, some 500 years after the city's demise. In the Nahuatal language the name Teotihuacan means ?The City of the Gods" or "Where Men Become Gods". Indeed, the setting, coupled with the site's stunning architecture, lends itself to this description. For the Aztec's, whose empire reigned some 500 years after Teotihuacan, the city was the most venerated and sacred spot on earth. 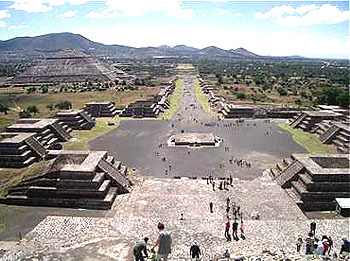 According to Aztec legend, the moon, the sun and the universe were created at Teotihuacan. 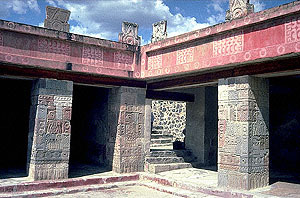 The Aztec Empire adopted Teotihuacan's symbols and motifs in their own cosmology. The city was so highly regarded that Aztec royalty would make pilgrimages to the site. 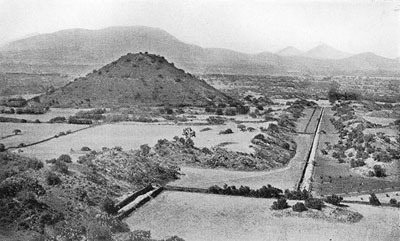 When visiting Teotihuacan, one is immediately struck by the orderly lay-out of the city, which is aligned on a north-south axis. This alignment is occupied by the city's main thoroughfare which is called "The Avenue of the Dead". This avenue was so named by the Aztecs because they mistakenly identified the temples lining its corridor as burial chambers, tombs for the giants who they believed had built the magnificent city. This avenue extends for an incredible 2 and � miles and many of Teotihuacan's buildings can be found along this straight-away. When the city was in its full glory, the temples, palaces and pyramids were covered with limestone and painted with bright colors and elaborate murals. Fragments of red paint can still be seen on many of the site's buildings and one can only imagine how colorful the city must have once appeared. As you walk down the Avenue of the Dead, you will soon encounter the site's major landmark, the Pyramid of the Sun, the largest building at Teotihuacan. This magnificent edifice dominates the site and represents the third largest pyramid in the world, after the pyramid at Cholula (add link) and the Pyramid at Cheops, Egypt. The base of the Pyramid of the Sun measures 738 feet long and stands 246 feet tall. A temple once stood upon its summit but has long since vanished. It is no secret that the walk to the top is a long one, there are nearly 250 stone steps to climb. Thankfully, the stairs are interspersed with platform terraces where you can rest for a moment. The reward upon reaching the summit is an eagle's eye view of the city and the mountains beyond, especially if it's a clear day. A major and exciting archaeological find was made at this pyramid in 1971. A team of archaeologists located a tunnel on the pyramid's west side which leads to a cave underneath its base. Religious artifacts and remnants of ceremonial activities were discovered in this subterranean chamber. This cave undoubtedly was the catalyst for the pyramid being built where it was. Caves throughout ancient Mesoamerica cultures were frequently used for ceremony and ritual and were considered highly sacred. At the city's northern end is where you'll find the site's elegant Pyramid of the Moon. This structure has a graceful silhouette with stairs much steeper to climb than that of the Pyramid of the Sun's. It is highly recommended to make the effort, however, for the vista atop its summit offers a splendid overview of the Avenue of the Dead. Although shorter in stature (140 feet tall) than its companion, it appears to be the same height as the Pyramid of the Sun as it was built on higher ground. Archaeologists have been motivated by recent discoveries at the Pyramid of the Moon, including the discovery of tombs of high-ranking officials. The hope is that a royal burial will be discovered shortly, which could possibly lead to startling new revelations about the site's original inhabitants. In addition to the site's two major pyramids, there is a great deal more to explore and discover while visiting Teotihuacan. The Plaza of the Moon, which sits directly in front of the Pyramid of the Moon, houses many temples and features a square altar at its center. Directly to the west of the building lies the splendid Palace of Quetzalpapalotl, a lovely building decorated profusely with animals that are of a hybrid being, part bird and part butterfly. The murals housed here are splendid and well-preserved. After exploring Teotihuacan's northern end, the next stop on the agenda is to visit the buildings housed at the site's southern perimeter. It is here you will encounter the sunken square called ?The Citadel?. This grand arena is very large in size, covering some 17 square acres. The ancient city's administration affairs were conducted from this center and its inner courtyard accommodated thousands of people while in use. 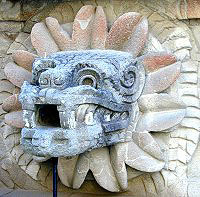 The Citadel also is home to the fantastic Temple of Quetzalcoatl (Feathered Serpent). This temple was an important point of pilgrimage for the city's ancient inhabitants who would worship and conduct rituals at its location. You will be greeted with fantastic sculptures of feathered serpents at this temple, which features some of the earliest depictions of this important deity. Teotihuacan was declared a World Heritage Site by UNESCO in 1987. The site's stunning architecture and vast historical importance made it a natural choice for such a designation. Should you be planning your trip in summer, be prepared for very hot weather. It is mandatory to bring a hat, sunscreen and plenty of water. As well, be ready for a lot of exercise as the site is vast and a sturdy pair of shoes will be needed. The elevation at the site sits at 7,000 feet, so if unaccustomed to such high altitudes, be sure to take plenty of breaks and allow enough time in your itinerary to truly visit the site. There are two fine museums located on the premises with some excellent artifacts. Also, be sure to bring a camera along as photographic opportunities are plentiful. Today, Teotihuacan remains a point of pilgrimage. Each Spring Equinox, thousands of people flock to Teotihuacan to welcome the dawn on the first day of Spring.